Through this section you can fine-tune several of Cherokee’s parameters. You should not attempt to do so unless you really know what you are doing. For most cases the default parameters will work just fine. You should at least read the chapter Optimizing Cherokee before you start tweaking things here. KeepAlive: Enables the global keep-alive support for the client requests. It increases the client performance by reusing a connection for more than one request. It should most probably be turned on. Max keepalive reqs: This limits the number of HTTP requests that can be served by each keepalive connection. Keepalive connections improve performance, but surpassing certain amount of requests per each connection is an indicator that something out of the ordinary is happening. This prevents the appearance of any problems related to these situations. Chunked encoding: Enabled by default to try to keep enabled Keep-Alive. Polling Method: This affects the internal file descriptor polling method among the ones supported by the OS. The full list of options is epoll(), kqueue, poll(), Solaris ports, select() and Win32. 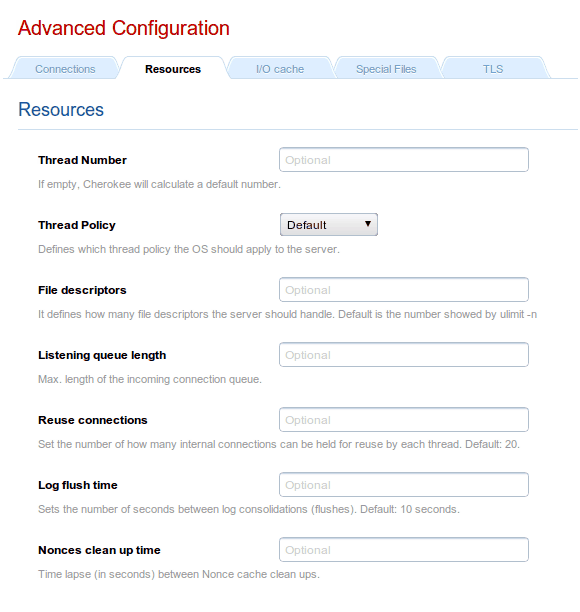 Only the alternatives available for your specific architectures are shown. If you don’t know what this is or how this affects performance, just choose Automatic. This will choose the most efficient one among the present at any given time. Sendfile min/max size: These allow to configure the range of file sizes that can be sent with sendfile(). Default: [32768 Bytes - 2 GB]. Thread Number: Adjust the number of threads for Cherokee to work with. Increasing this will allow for better parallelization at the cost of system resources. Highly constrained environments such as embedded devices will probably be fine with just one. This doesn’t translate into just one connection at the time, since a thread can handle many. Thread Policy: Defines the thread policy to be applied by the OS: FIFO, Round Robin or Dynamic. File descriptors: This can alter the number of file descriptors handled by the server should handle. The default value is what ulimit -n reports. An increase in this value improves performance under very high server load. Listening queue length: This specifies the size of the incoming connection queue. It is the effective buffer of connections that will be served even if there are no connection slots available at the moment. Reuse connections: Cherokee implements an intelligent mechanism to reuse connections if possible, allowing it to improve performance by not having to reinitialize structures in memory that can serve perfectly well for more than one time. It defaults to 20. Though this mechanism is an obvious improvement, reducing this limit is useful for cases when a sudden burst of connections happens. In those cases it doesn’t make much sense to keep reusing many more connections than those of an average load for any other moment. Log flush time: Time interval in seconds to wait between log updates. Defaults to 10 seconds. Nonces clean up time: Time interval in seconds between Nonce cache clean ups. Defaults to 60 seconds. Status: Enabled by default. 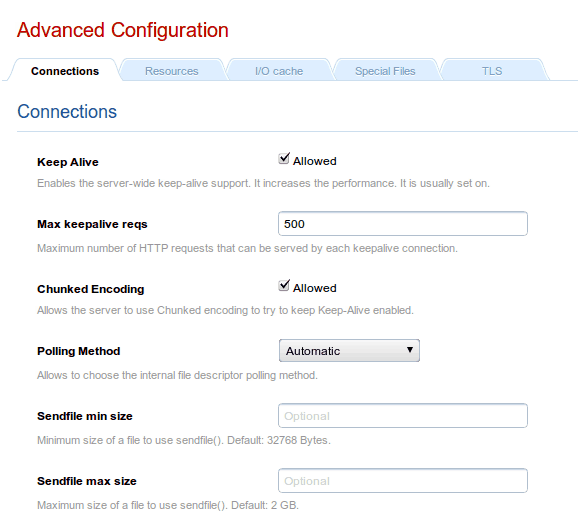 This is a system-wide setting required if you wish to enable caching in any of your virtual hosts. Useful for debugging. 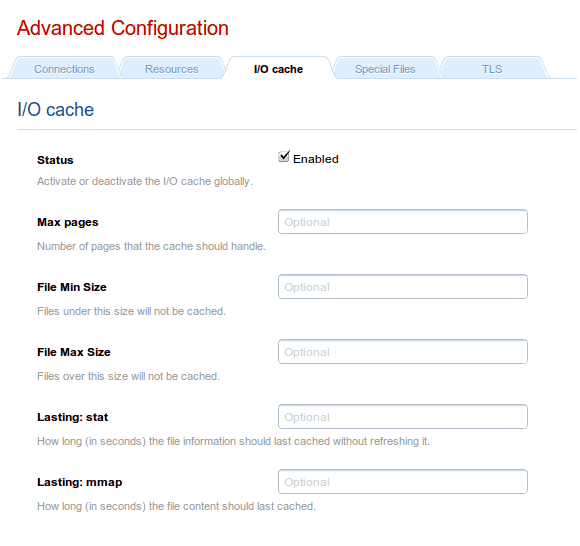 Max pages: This specifies the maximum number of pages that are handled by the cache. File Min Size: Specifies the smallest filesize limit to be cached. File Max Size: Specifies the biggest filesize limit to be cached. Lasting stat: Specifies the duration of the file information in the cache without refreshing. Lasting mmap: Specifies how long the file contents last cached. Panic action: This specifies the program that will be called in case the server fails. 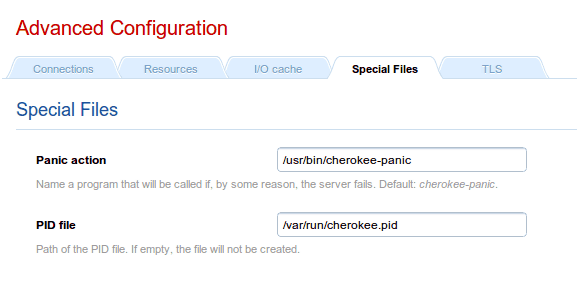 It defaults to cherokee-panic, which is provided with Cherokee. This in turn performs the actions specified in the CHEROKEE_PANIC_OUTPUT environment variable. If none is set, it will attempt to send an email to the system administrator with a backtrace of what happened. As a last resort, if no mailer is available in the system, it will simply try to show this information on screen if possible. PID file: If specified, a PID file will be created in that path. This is useful to trace what is going on with Cherokee. 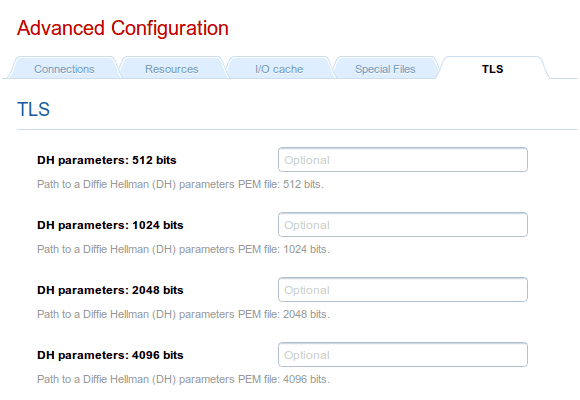 DH parameters: Here you can specify the paths to your Diffie Hellman parameters PEM files for 512, 1024, 2048 and 4096 bits.